You see them on planes, their headphones plugged in before the audio has even begun, listening to the air traffic control information, their little fold-out map ready for take-off. They are the plane nerds, the people who don't read People magazine or wonder if they can score two bags of peanuts during the flight. 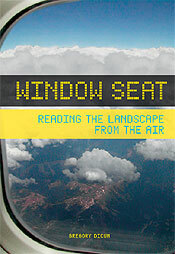 Instead, they have been waiting for the release of "Window Seat: Europe" ($14.95, Chronicle Books), page after page of aerial photographs that show what you will see when you look out the window over it, with an accompanying map depicting major flight paths and narrative on the landforms, waterways and other landscape features. Tips are included on how to spot such big-time attractions as the Eiffel Tower and the Autobahn, as well as how to pinpoint the lesser-known stuff like ruins and power plants. Window Seat Europe: Reading the Landscape From the Air directs your attention away from the cabin. Author Gregory Dicum insists on a window seat every time. "Taking a commercial passenger flight is one of the unheralded joys of life in the modern world," he writes. "Sure, the food might be utilitarian, the seat cramped, and your neighbour annoying, but the sheer pleasure of contemplating our planet from 10 kilometres up in the air is worth any price. A century ago, nobody on Earth could have hoped to see this view, and yet it's yours--free--with every flight you take." Well, when you put it that way. 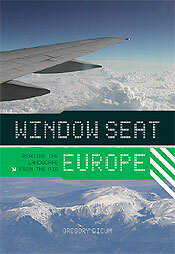 Window Seat Europe follows the same formula as Dicum's 2004 Window Seat that focused on North America. With the aid of colour aerial photos, he divides up the region and points out what to look for. It's not about spotting the Eiffel Tower but reading the landscape and learning a new "visual vocabulary" to distinguish features from on high. He outlines the geographical layers such as rock, water, plants, and man-made objects like highways, and how they influence one another. It's like an art and geography lesson at 35,000 feet. There's also a chapter on the sky, with illustrations of the different types of clouds and an answer to that timeless question of why the sky is blue. I took Window Seat along on a recent flight east from Vancouver. Even from the middle seat, the view down on the Rockies was undeniably impressive. A tableau of rippled earth dotted with brilliant aquamarine lakes, craggy peaks poking through pristine snow�one forgets how magical it really is. Then the guy next to me shut the window shade. With in-flight cutbacks and carry-on restrictions, flying has become so unpleasant that perhaps it's time to get back to basics: looking out the window. Overriding current anxieties of commercial flying, Dicum celebrates the joys available by choosing the window seat. "The food might be utilitarian, the seat cramped, and your neighbor annoying," Dicum writes. "But the sheer pleasure of contemplating our planet from 35,000 feet (about 6.5 mi., or 10.7 km) in the air is worth any price. A century ago, nobody on Earth could have hoped to see this view." ... Bound to provide considerably more entertainment than the in-flight movie.